After graduating from cultural studies I worked several years as consultant and trainer for corporate culture. But soon I felt the urge to change my life style completely. In 2006, I started to practice yoga and meditation and changed my diet. 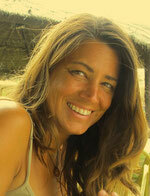 At the end of 2007, I started studying yoga, massage and Ayurveda in India and Munich. At the beginning of 2008, I took a chance to move to Spain and live my dream: a simple life – in and with nature – and working my vocation. I continued my studies in meditation, Ayurveda, Reiki, energetic healing amongst others in Spain, as well as Kundalini Yoga and Ayurvedic massage in India. Since then I live in Andalusia, whereI hold seminars and organize retreats, give Ayurvedic massages, sessions in energetic healing, yoga and meditation as well as Ayurvedic diet and cooking classes. I’m following a beautiful path of inner exploration with enriching experiences and it’s my pleasure to share these with others.